Hiking boots are a type of footwear specifically designed for protecting the feet and ankles during outdoor walking activities such as hiking. Hiking is the preferred term, in Canada and the United States, for a long, vigorous walk, usually on trails (footpaths), in the countryside, while the word walking is used for shorter, particularly urban walks. On the other hand, in the United Kingdom, and the Republic of Ireland, the term walking is acceptable to describe all forms of walking, whether it is a walk in the park or backpacking in the Alps. The hiking boot is possibly one of the most important items of hiking gear, since their quality and durability can determine a hiker's ability to walk long distances without injury. Most hiking boots are also designed for other outdoor activities such as backpacking, climbing, mountaineering, and hunting. Hiking boots are constructed to provide comfort for walking considerable distance over rough terrain. Boots that protect the hiker's feet, heel, and ankles are recommended. Hiking boots give ankle support and are fairly stiff; the stiffness can vary by design, materials, and purpose of the footwear. Specialty hiking boots may have varying degrees of stiffness so that they are more appropriate for particular hiking conditions or activity planned by the hikers. Hiking socks that wick sweat from the feet, provide warmth, and cushion the feet are recommended and a thin, inner sock may also help. Traveling with a good pair of socks is also an important aspect of hiking. We are definitely not suggesting that you walk with wet socks. However, if you think you will be getting wet, keep in mind that wool socks can maintain heat even when wet. There are a few primary types of hiking footwear. Obviously, you can technically wear any type of shoe for walking, but these are the most common for trail adventures. Trail shoes are made for hiking in dry climates, on well-established, less rugged or rocky paths. They are suitable for many types of day hikes. These can also be called hiking shoes or day hiking boots. Trail hikers are for steeper inclines and muddy paths. They are used where a lightweight boot is most suitable. Trail hikers are also sturdy, higher-cut, and watertight. These boots provide more stability and ankle protection against protruding limbs and rocks than hiking shoes do. Mountain walking or hiking boots are designed for mountain and hill walking, backpacking and mountaineering. Mountaineering boots are typically designed to be used with crampons. To achieve compatibility with crampons, welts are moulded into the toe and heel of the boot, providing a platform for the crampon to attach to. The stiffness of the boot enhances the precision of the crampon and allows a climber to pursue steeper and more difficult terrain. Crampons can be attached to them for a better grip on glaciers or hard-packed snow. They are extremely strong, durable, and have stiff soles to give the ankles support and protection on difficult rocky trails. Mountaineering boots are usually taller and stiffer than hiking boots, providing insulation as well as support and protection. Another important aspect of mountaineering boots is warmth. To prevent frostbite in extreme cold conditions, synthetic insulation is incorporated into the boot. Lighter weight boots are classified as single boots. These single boots are insulated as a single unit with the insulation being permanently attached to the rest of the boot. Double boots, another classification, typically consist of a non-insulated leather or plastic outer shell with a removable insulated liner. The purpose of a double boot is long-term protection from cold weather. If the liner becomes wet, it can be removed from the shell and dried inside a sleeping bag. It is important to note that some brands or retailers may use different terminology to describe the footwear. You should really consult with the retailer if you have any questions before making a purchase. For example, you can learn about types of hiking boots from REI. Construction of Hiking Boots: below are the primary parts used to manufacturer this kind of footwear. The following are common components, but each of these are NOT on every pair of shoes you will find in the market. You would have to check the specific boot to determine its features. Insoles / Footbeds - Insoles are the bottom part of the inner that the feet rest on. Insoles that are perfectly shaped to the hiker's feet will ensure maximum support and balance. The insole is the interior bottom of a shoe, which sits directly beneath the foot under the footbed (also known as sock liner). The purpose of insole is to attach to the lasting margin of the upper, which is wrapped around the last during the closing of the shoe during the lasting operation. Soles - Hiking boots have deep-lugged soles of tough rubber to provide friction and avoid slipping on any surfaces. Soles absorb and redirect shocks, and provides cushion for the feet. Tongues - The flaps that cover the inlet of the upper are called tongues. This is the part the goes underneath the laces. Tongues make sure that water, dirt and debris will not enter the boots. 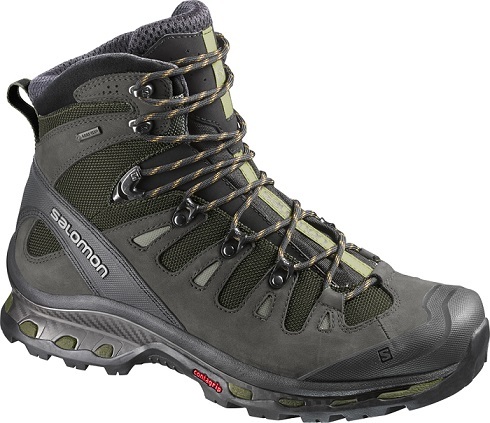 Upper - The upper part of a hiking boot is intended to protect and support the foot with an all-over snug fit. Uppers should be water repellant/proof, but allow the feet to breathe to prevent excess moisture from causing blisters and other discomfort. Linings and Paddings - Linings and paddings provide more protection and comfort for the feet. Shanks - The stiff plastic or metal plates built into the sole. Boots are made with full, three-quarter, or half-length shanks. Longer shanks make for stiffer boots. In a boot or shoe, the shank is a part of the supportive structure between the insole and outsole. The presence of a shank is crucial to the functionality of mountaineering boots as they diminish the load incurred by the wearer’s feet and calves over the course of an ascent. Traditionally constructed of steel, contemporary shanks are more commonly made up of less heat conductive but equally rigid options such as fiberglass and Kevlar. The rigid nature of these materials contributes a protective element to the footwear into which they are integrated, helping shield the wearer’s feet from puncture wounds and stone bruises. Scree Collars - Protects the Achilles tendon and ankle from chafing. Crampon Connections - Crampons are worn on boots to provide traction on snow and ice. We hope that this helps you better understand proper footwear for your outdoor trail walking adventures. Learn about other types of shoes such as snow boots and rain boots. Here are a few places that we recommend you research if you are planning to purchase hiking boots. 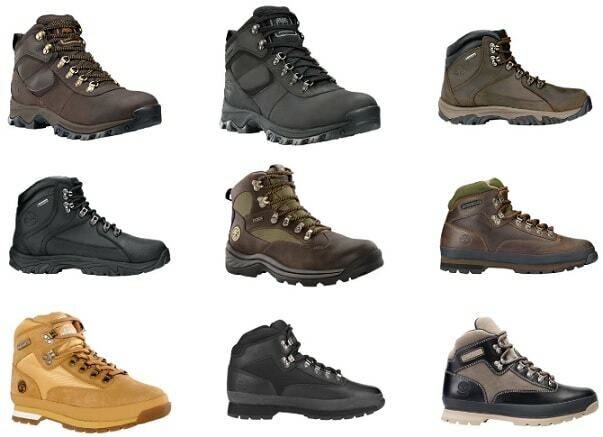 You may want to also visit our men's hiking boots guide.